X-Cart Review: Shopping Cart Software. We Find Out What Makes It Different. 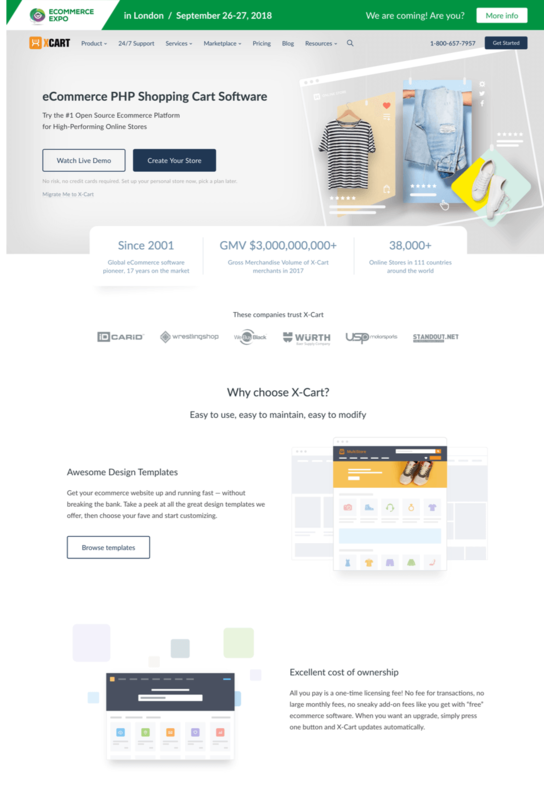 This X-Cart review (2019 update) will help you make the best-informed decision whether or not you should buy e-commerce software from X-Cart. Do you know exactly what you want, and you want a PHP-based e-commerce solution? Then look no further than X-Cart. X-Cart is a leading PHP shopping cart e-commerce software. More than 35,000 online stores around the world use and rely on X‑Cart as their e-commerce platform of choice. Their self-hosted e-commerce software has a range of cutting-edge features that make it easy to start and run your online store. Known as one of the fastest e-commerce solutions on the market, that is extremely flexible and comes packed with many features. Take advantage of X-Cart’s free 30-day trial – no credit card required and no commitment. X-Cart’s cheapest paid e-commerce software plan is 495.00 per month. 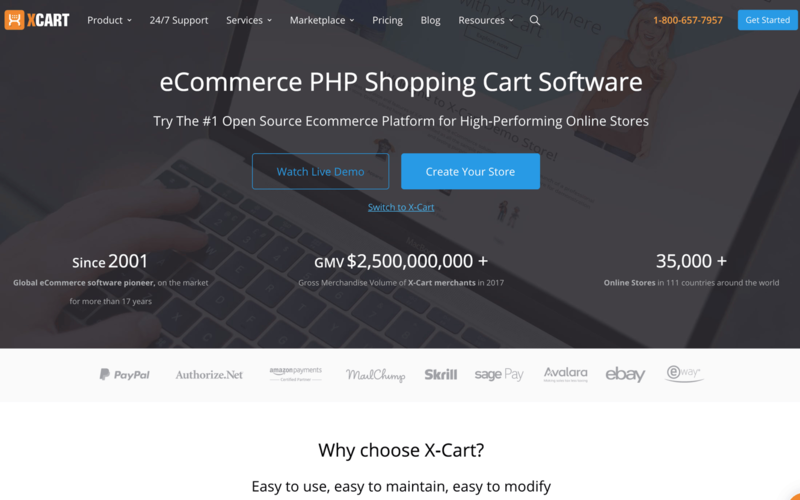 X-Cart is an open source PHP shopping cart e-commerce software platform that enables online merchants to process orders, track inventory, and manage every aspect of an online store. It was created more than one decade ago by serial entrepreneur Ruslan Fazlyev. 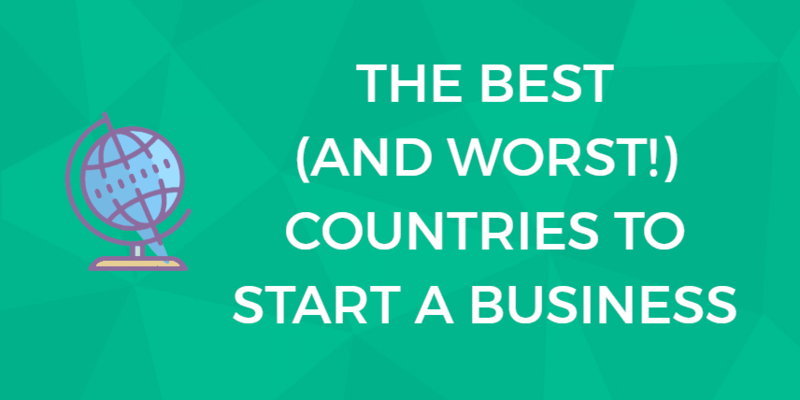 At the time of writing this review, the company boasts a user base of 30,000+ online stores. Try X-Cart with a 30-day free trial. Founded by Ruslan Fazlyev in 2001. X-Cart 5 is a self-hosted shopping cart. Users are free to choose their own third-party hosting provider but they will have to buy and install an SSL certificate in order to offer secure checkouts. Alternatively, X-Cart offers hosting services with either a shared or a dedicated SSL certificate depending on the chosen plan. The following X-Cart overview will focus more on the shopping cart itself. So, if you’re searching for a shopping cart that can help you run a webshop, read on to find out if X-Cart is the right fit for your online business. Try X-Cart for free with a 30-day trial period. Just like most digital shopping carts, X-Cart offers the ability to integrate your online store with additional add-on applications to expand functionality. To get add-ons for your webshop, simply visit the X-Cart marketplace. There are many extensions for both X-Cart 4 and 5. Most of them are free but some require payment or a higher tier license. With X-Cart’s add-on integration support, you can hook up your online store with tools that perform extra tasks. 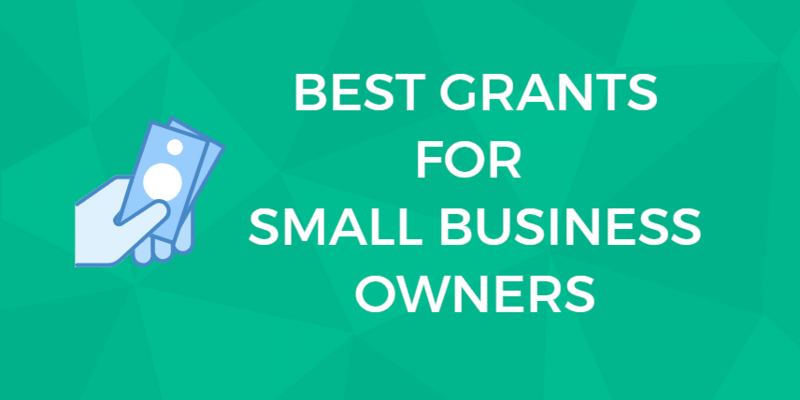 For instance, there are add-ons for processing online payments, email marketing, drop shipping, and more. You can accept both credit/debit cards and e-payments on your online store when customers checkout out with X-Cart. This shopping cart integrates with more than 75 payment providers, including but not limited to PayPal, Skrill, Stripe, Authorize.net, FirstData, and Chase Paymentech. X-Cart integrates with X-Payments, a PA DSS certified software that complies with PCI standards. X-Payments will provide an encrypted online form where customers can enter their credit card details or choose to checkout with another payment method on a secure page. Once you’ve created a merchant account, all that’s left to do is select the preferred payment gateway(s) from the X-Cart admin area then the software will handle integration. Furthermore, customers can swipe PayPal Debit MasterCards at your brick-and-mortar store if you integrate your webshop with the PayPal Here chip and pin reader. 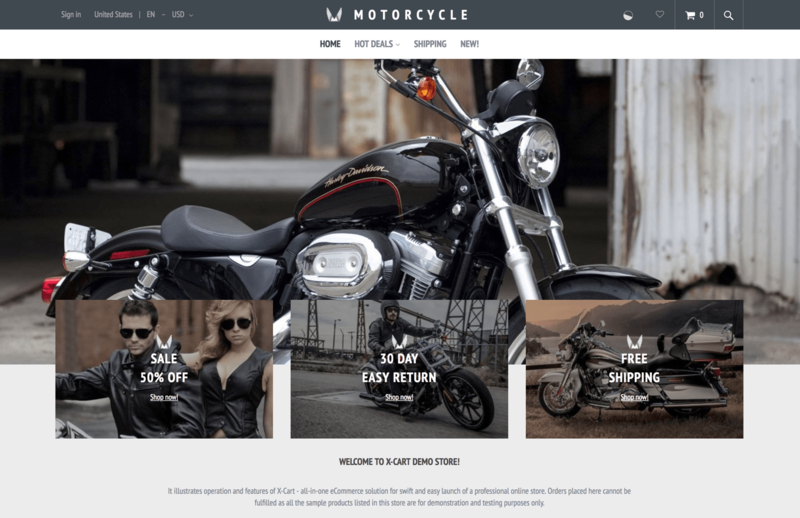 When it comes to online store design templates, X-Cart is a bit limited compared to what most shopping cart providers offer. This shopping cart only features a dozen free CCS-based themes, 4 free color schemes, and about 35 paid design templates. All themes from X-Cart feature a responsive design. This means your online store will automatically adapt to the screen size of any device that’s used to access it, offering an optimal display for that device. “Webmaster mode” allows you to quickly modify any template. After applying changes, you can view your store just as customers would see it by clicking a bar above the top-level navigation. Demo: You can interact with each X-Cart site template before purchasing it. Each template is open-source and fully customizable. You can utilize several marketing tools to promote your online store when using the X-Cart shopping cart. These options will make your online store more search engine friendly. Easy CDN integration: a CDN — or content delivery network — will speed up your site. Speed is directly correlated with conversions, so if you’re selling anything, you need to be concerned with site loading speed. Speed also impacts Google ranking. Analyzing your site’s structure, which can have a significant impact on SEO. Making recommendations for improvements. Success stories: the X-Cart site features testimonials of successful e-commerce store owners, like Standout, pictured above. Visiting the stores cited in the success stories is one of the best ways to get an idea of what’s possible with X-Cart. Here are a handful of the functionalities, apps, and integrations available. Note: Not all are free. Integration with Mail Chimp or other similar add-ons allows you to launch an email marketing campaign. Google Experiment is an add-on that integrates with Google Analytics and allows you to run A/B testing. Simple A/B testing can significantly improve your conversion rate. Google Customers Review integration allows your site to display Google reviews. The “Hurry Up” integration notifies a visitor, in real time, when a product they are viewing is in low stock. Criteo One-Tag is one of several advertising integrations. Note: You could accomplish the same easy integration by setting up Google Tag Manager. SendPulse integration: SendPulse is an AI platform that detects the best time to send email, SMS, and web push notifications, in order to optimize open rates. Facebook E-Commerce app allows you to easily integrate your X-Cart site with Facebook and sell your products on the social platform as well. Segment integration: You can think of Segment as data piping that can be used to connect any tools, with no coding required. Abandoned Cart Reminder: This app sends an automatic email notification (that you draft) to a user who almost — but didn’t — check out. The reminder can offer a discount for checking out or some other persuasive offer. X-Cart 5 comes with an affiliate partner program, which enables other sellers to market your brand in exchange for commissions. This version also enables customers to leave reviews, allowing you to use the power of positive testimonials to promote your brand. Need to Host an Online Auction? Another unique marketing feature that X-Cart offers is the ability to host an auction. There are options to set the entry price, auction duration, and minimum bid increments. The auction function will come in handy if you sell collectibles or antique products. Through X-Cart’s loyalty reward program and discount coupons, you also have the power to keep customers coming back. From e-goods to physical products to subscription services, you can sell virtually anything with the X-Cart shopping cart. The number of products you can upload to your online store will only be limited by the storage space that your server provides. However, product options have no limit so you have the choice to create unlimited variants based on size, color, weight, and other attributes. The catalog editor can import CSV files, so it’s possible to move an existing product database to your X-Cart store. X-Cart offers inventory-tracking features as well, which let you monitor the number of products in stock. This X-Cart video explains why having separate SKUs for different product variants is important. The video above provides an overview of product classes and attributes. X-Cart maintains an active community forum and provides plenty of help documentation on their online knowledgebase center and FAQ pages. You can also contact the customer service desk via phone or fill a form on the “Contact Us” page then send your message as an email. Alternatively, simply use the Live Chat service on the site to get in touch with a customer service rep.
It’s important to note that there are additional charges for technical support. Be sure to check what areas technical support doesn’t cover before buying a support ticket. Tip: Paying for technical support on a month-to-month basis compared to purchasing a single incident ticket is cheaper. As mentioned earlier, X-Cart 5 offers multiple packages from which to choose. X-Cart 5 offers a free trial even with the higher tier plans. Before making any decisions, it’s prudent to try out all the X-Cart shopping versions while taking into account their differences in pricing and features. What are the Pros and Cons of X-Cart? So is X-Cart any good? Here’s a quick list of pros and cons to keep in mind for those that are thinking about making X-Cart their preferred shopping cart. X-Payments integration is PA DSS certified and PCI compliant. Therefore, X-Cart allows you to process online payments without compromising sensitive customer data. The shopping cart is compatible with many payment gateways. The downloadable, self-hosted version of X-Cart gives tech-savvy users the freedom of choosing their preferred web hosting and SSL provider. X-Cart is an open source platform that’s totally customizable and scalable. Some packages provide multilingual and multiple currency support. Technical support will cost you extra. X-Cart 5 offers hosting services separately at an extra cost. 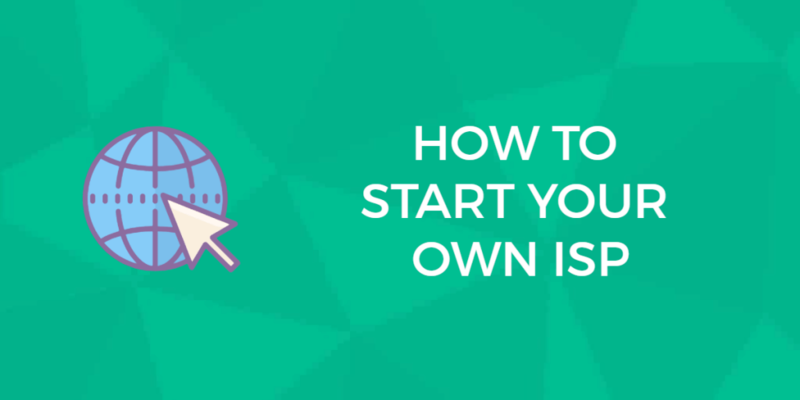 Setup requires manual coding when using the self-hosted X-Cart versions. Lifetime licensing fees for the X-Cart software is slightly expensive, especially with higher tier plans. Overall, X-Cart is a solid shopping cart with plenty of features. But while its self-hosted versions can compete with the likes of Magento, keep in mind that these versions are more suited for tech-savvy users or online merchants who can afford to hire a professional to install the software. If you want a shopping cart that’s easier to set-up, consider going for other equally robust cloud-based options such as BigCommerce or Shopify. Below we answer some of the most common questions about X-Cart. Don’t see your question answered? Drop us a line. We’d be happy to research it for you. Does X-Cart provide help with GDPR compliance? I’m not very good with technology. Do I need to understand programming to use X-Cart? X-Cart is very user-friendly. There are also extensive user guides and a helpful technical support team that make it easy for anyone to use X-Cart. You do not need any programming knowledge to use this product. Does X-Cart protect my customers’ credit card information? You can opt to use X-Payments, a payments processing module which is PCI Level 1 certified and which integrates with X-Cart, Magento, Zoey, osCommerce, and a few other e-commerce platforms. You can also opt to combine X-Payments with PCI DSS compliant hosting in one package. See the X-Payments page for more information. Can I buy X-Cart software once and use it on multiple sites? No. You will need to purchase a new license for every website. What if I move my website to a different URL? Will I need to purchase a new license? No. You can transition your license from one URL to another easily. Can I use X-Cart if I’m not in the United States? Yes. X-Cart supports multiple languages and currencies available, optimizing it for use in nearly any country. Will X-Cart work on my customers’ mobile devices? Yes. X-Cart is mobile-capable, allowing your customers to make purchases no matter where they are. There’s also a mobile admin site, so you can bring your work with you wherever you go. Can I use X-Cart with my existing payment platform? Yes. X-Cart is fully integrated with over eighty major payment platforms. Do I have to re-design my entire website if I switch to X-Cart? No. X-Cart can easily be integrated into your existing design. I see customers can rate my merchandise. What do I do if I have a troll on my website? You have full control over editing and deleting ratings. Can I set up an auction? Yes! X-Cart lets you create and set up auctions. Will X-Cart help me manage my inventory? Yes. X-Cart tracks and displays your stock levels. Can I manage my X-Cart site offline? Yes. You can choose to have reports emailed to you, so you can manage your orders away from the internet. Can I use X-Cart if I conduct my business on eBay? Yes. You can fully manage your eBay listings through X-Cart. Does X-Cart add tax onto my orders? Yes. X-Cart is up-to-date on all tax regulations and manages the charges for you. X-Cart 5 offers several packages to choose from, including a free edition too. With the premium packages, you’ll need to pay a one-time fee for the lifetime license to own the software. After the first year, users must pay an annual fee to continue receiving software upgrades. For the latest and up to date prices visit X-Cart’s website. We monitor tweets about X-Cart and apply sentiment analysis to classify tweets as positive or negative. This allows us to output an approval rating score, which is based on real people, positive and negative, opinions about X-Cart on Twitter. X-Cart approval rating score is 71%. This is based on a total of 7 tweets that mention X-Cart on Twitter. 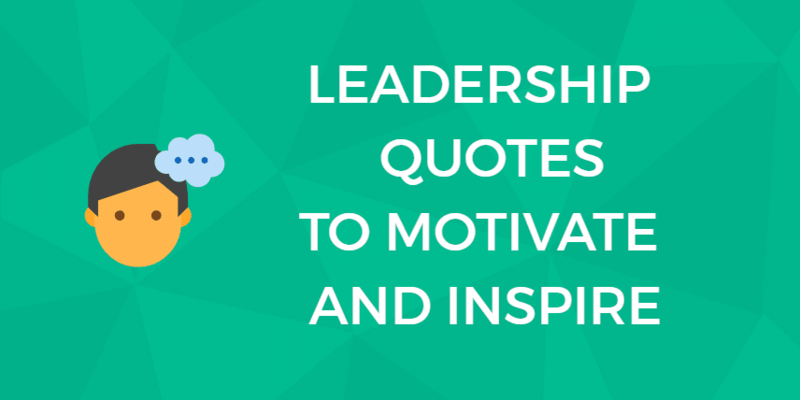 There are 5 mentions that share a positive sentiment and 2 mentions that express a negative sentiment. Find out more about how it works. We met @maxvydrin from @x_cart at @ecommerceexpo and it was very inspiring! Thank you for your time. We're looking forward to doing great things with you! Working with @x_cart as as awesome as playing #IceHockey ! Perception System achievement: 1500+ @x_cart Addons installed in year 2016, Thank you all #x-cart #module #customers. E-Commerce design services to https://t.co/1Ee9UX0TE3. (Developed using @x_cart). Good work done by our X-Cart Design team! Try X-Cart. 30-day trial period means it's 100% risk free. You are here: Home > E-Commerce Solutions: Which Is Best For Your E-Commerce Business In 2019? > X-Cart Review: Shopping Cart Software. We Find Out What Makes It Different. 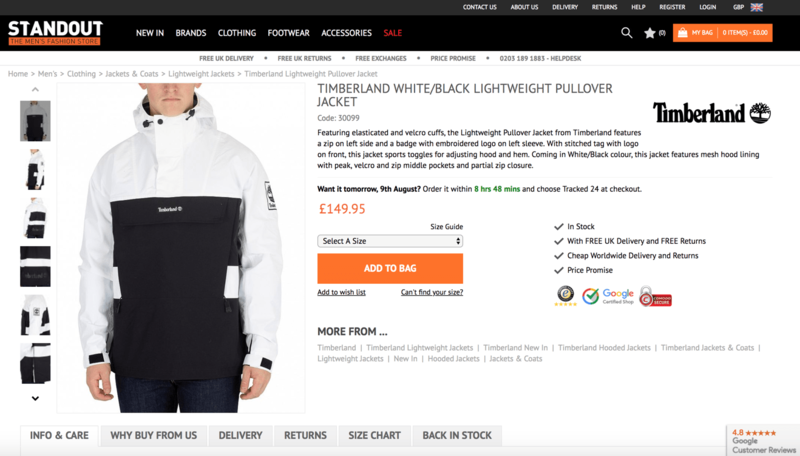 Previous: UltraCart E-Commerce Review: Easy on The Wallet – But What About Features? Next: Big Cartel Review: Designed For Artists But Here’s Why It Could Be Right For You.